This is a proof that you can do much with only one line of perl code. 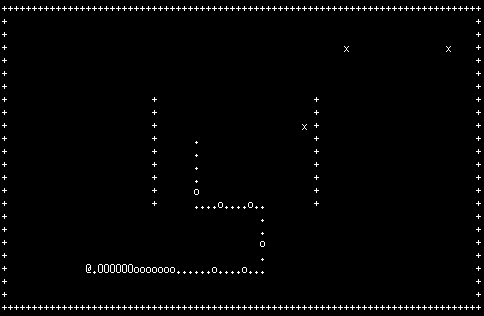 It has a sweet animation in the beginning, an array-based level engine and even the worm is animated! Okay, the "milestone 23" is 2722 bytes large but it does not contain any newline and is entirely written using Eterm as "editor / development environment". worm-guide uses a simple worm engine worm.pm that I've written. You need to copy 'n paste the contents of worm_guide_mX.pl to a terminal; you cannot just call it by "perl worm_guide_mX.pl" or "./worm_guide_mX.pl". If that sweet animation gets on your nerves you can disable it by calling worm-guide with "noani" as its first parameter. There is a port of worm-guide to termfusion called fusionworm; see above under termfusion.